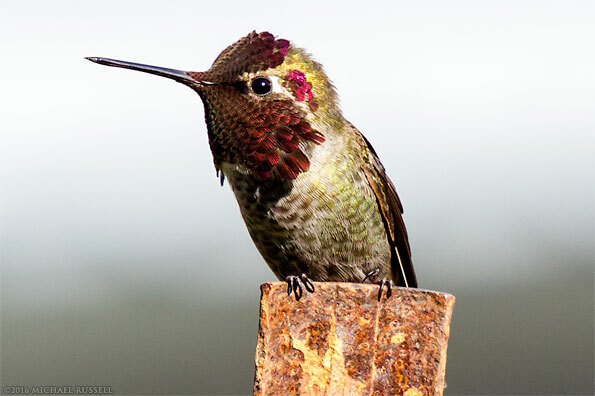 A male Anna’s Hummingbird (Calypte anna) sitting on a garden post. Photographed in late winter in the Fraser Valley of British Columbia, Canada. 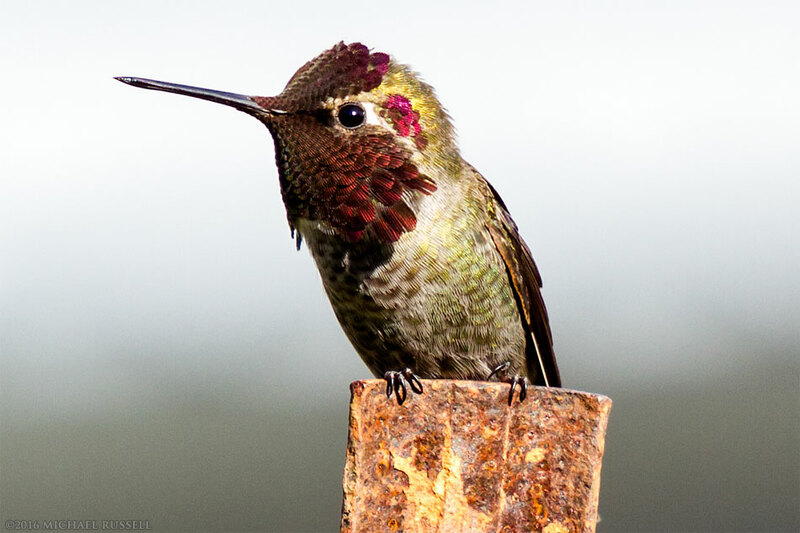 Almost a month ago I wrote about trying to photograph a male Anna’s Hummingbird (Calypte anna) in my backyard. I had noticed him sitting at the top of many of my trees singing during most afternoons first song on this page. 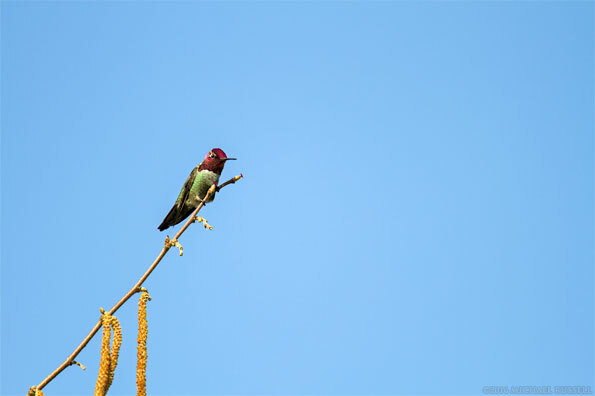 As of today he is still up there singing away, perhaps he is having some trouble getting noticed in the Hummingbird dating scene, I’m not sure. A week or so after I posted my Black-capped Chickadee photo as a sort of hummingbird consolation prize, I was able to photograph this male in the vegetable garden. 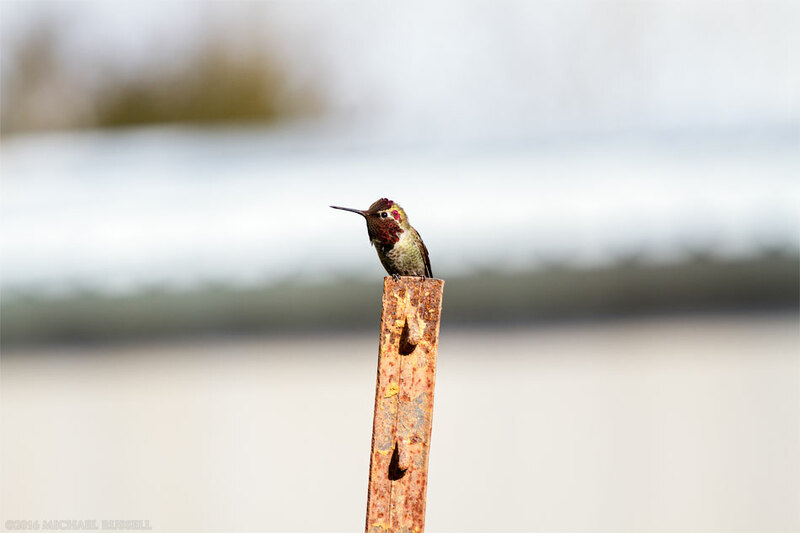 It is rare that I am able to spot wildlife in my backyard and still have time to get in the house and grab the camera, but this Anna’s Hummingbird is pretty predictable in the order of trees he chooses to sing his love ballads from. He is also probably used to me staring up at him by now. I first photographed him at the top of the Hazelnut where he sat for a long time. I actually found making a photo of him reasonably difficult as the magnitude of light reflection from his purple gorget (the neck/throat/head feathers) was so high it would throw off my exposure. The bottom photo here shows a happy medium between the full purple/red brightness of his gorget feathers and the rather subdued reddish/brown shown in the first image. After singing at the top of the Hazelnut for a while this male headed further back into the property and sat on a Mountain Ash tree, but only for a second. He immediately took flight again and almost got right on my face. Perhaps this was a territory thing or he was just curious, I’m not sure. Either way I was glad to see him land on a metal post very near me, and posted for just 3 photos before taking off to another frequently utilized perch in a Walnut tree. The first photograph here is that image, though I’ve cheated somewhat and cropped it to nearly 100%. You can see the uncropped version here. While I would love to get a hummingbird in flight photo seeing them perched has been pretty rare for me so I am happy to have good results. You can see a cropped version of this second photograph here. Note the very small hazelnut flowers at the end of those buds – this was the first time I had noticed them. For more bird photographs please visit my Bird Photos Gallery. How adorable! I didn’t realize they stayed that far north in the winter. I though they all came down here! 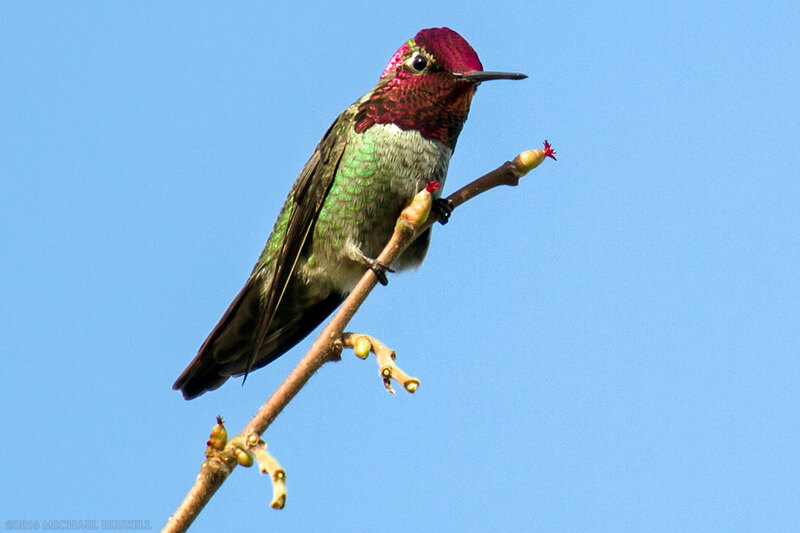 The Anna’s Hummingbirds do stay, but you are right in that a lot of species head south to warmer climates for winter. Their range is actually (in winter) all the way up through the Alaska panhandle – much further north than here.